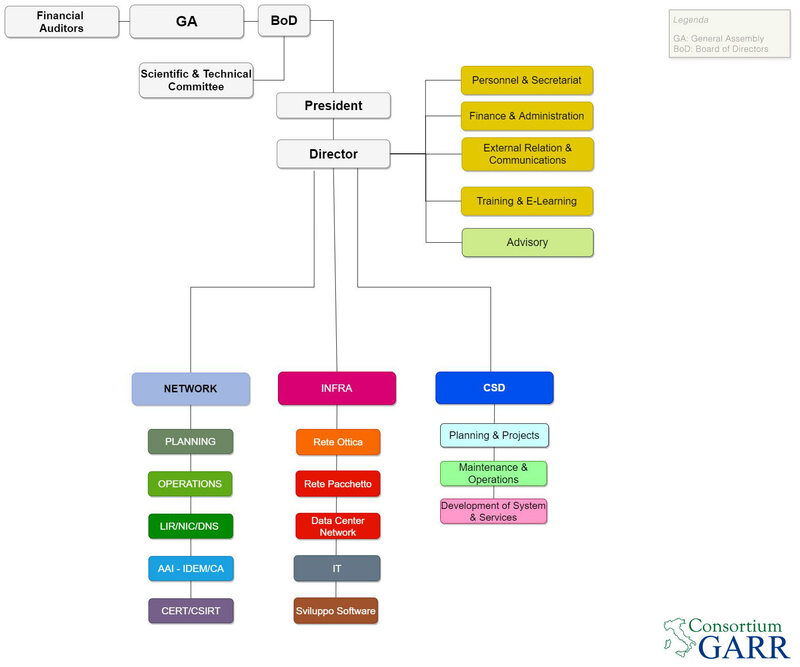 Who manages the GARR Network? The GARR Network is created and managed by the Consortium GARR, a non-profit organization founded under the aegis of the Ministry of Education, University and Research. The founding members are CNR, ENEA, INFN and Fondazione CRUI representing the Italian Universities. Who can access the GARR Network? The GARR Network is the only national network dedicated to the education, research and culture community. Who should I contact to request or to change a connection to the network? How much does it cost to access the network? From an economic point of view, access to the GARR network is regulated according to the configuration identified to meet the specific needs of the applicant organization. Organizations wishing to use the GARR network are required to pay for the connectivity service (proportional to the required access bandwidth capacity) which also includes a series of technical-operational support services and advanced application services. The cost related to the creation and management of the organization's internal network remains the responsibility of the user. I can not access the X site, is it a network problem? There is no single answer; the following general indications can help a preliminary diagnosis (remember that the competence of reporting to NOC any faults is exclusively of the APM). If X belongs to an institution connected to the GARR Network, before notifying the NOC, check that no trouble tickets have already been issued (sent to APM e available on NOC website) that indicate the cause of the problem and possibly check if the problem occurs only towards a single machine (in which case the fault is probably not due to GARR malfunctions), or if it is more general. If X does not belong to an entity connected to the GARR Network, it is advisable to check with a traceroute if in general it is possible to exit the GARR network; on NOC website, a traceroute with a web interface is available to help in this diagnosis. If it is possible to reach destinations outside the GARR Network but not to a specific site, the problem is probably due to causes outside the GARR. On the GARR website, all network statistics are available (both backbone and user access), which can be ordered by PoP and by Organization (user). The system is integrated with the GARR www server to provide daily graphs showing two-day traffic with values taken at five-minute time intervals. For general Internet traffic, research (GÉANT) and national peering, an ad hoc graph has been created representing the historical traffic of the last six years. Who are the reference persons for the management of personal data?